I need a bit of help understanding Bonds and their purpose. 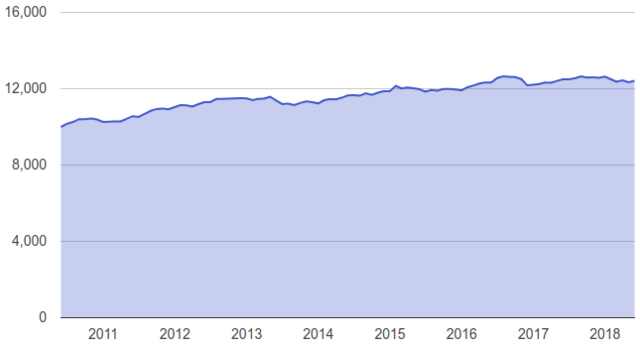 I've been following the 3 fund approach for 8 years and when I first started I had contributed to all three funds (Total Stock, Total Intl Stock and Total Bond). I was looking at my balances recently and see the Bond fund is showing an overall loss. One question I have is.... if Bonds are invested in US treasuries with (what I think should be a guaranteed yield) shouldn't they show at least some gain? I think I understand the purpose of Bonds and that they act as a safe spot should stocks drop, but if the Total Bond Fund is operating at a loss (at least my funds are showing a loss).... I'm perplexed. I thought Bonds would/should provided a source of income. 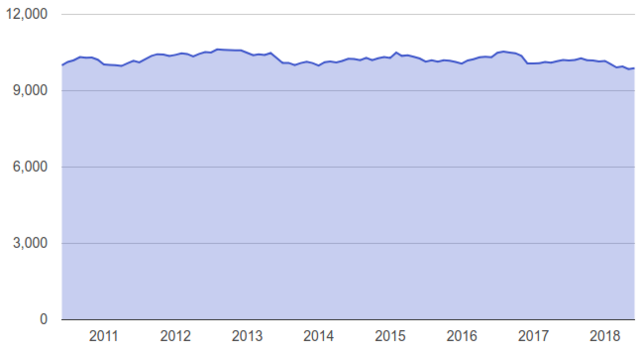 Over the past year or so when I make monthly contributions I've been allocating 100% of the contribution to the Total Stock Fund.... and maybe I should make a change to my AA. My current AA is about 70% stock and 30% bond. I've got 2 years or so until I start to draw on my retirement accounts and trying to get things in order with a little planning for that. Thanks for any help suggestions regarding the Bonds "thing". The purpose of bonds as part of a portfolio is to reduce the volatility of returns. That means that returns from stocks are highly variable from year to year, possibly running from as low as -50% at an extreme to +50% at the other extreme (It could be even bigger losses in a really bad crash.). The standard deviation of annual returns of stocks is around +/- 20% per year. Bond returns are much less volatile from only a percent or so for short CDs* to perhaps 7% or 8% for high yield corporates. If you don't want your returns coming in with all that uncertainty from year to year the effect can be diluted by including an allocation to bonds in the portfolio. But all of that does not mean bond investments can't lose money. Bond return in a year can be negative but not by the huge amounts stocks can go up and down. As to income, that is a different story, but the idea that bonds are for income is a misunderstanding. Income can be withdrawn from a portfolio of any sort of assets at any time. *Note CDs and savings accounts do not have zero variability of returns because the interest rate paid, which is the return, can change. For a CD over time that happens when the CD matures and has to be replaced with a new one with no guarantee of getting the same interest rate. Many brokerages only show gains/losses on a price-only basis. This is misleading. As I said, this is misleading, because it ignores distributions. I don't see 8-years losses, here. I'm pretty sure the perceived "losses" are just because of a brokerage's misleading price-only display. Last edited by longinvest on Wed Jun 06, 2018 8:36 am, edited 3 times in total. I agree with longinvest. I doubt you have actually seen losses in your bond holdings unless you are looking at a purchase made just last year. If you think you actually have losses, please let us know the date invested, and the fund invested in so we can look under the hood. The point above is valid. However, there are still intervals when the investment with interest can lose value. It is probably better to characterize such investments in conventional financial terms of expected return (mean of return distribution) and risk (standard deviation of return distribution) than to think of a bond as a savings account. Whether or not it matters depends on how upset one gets if one's investment declines in value at one point or another. For a holder of bonds as part of a portfolio of stocks and bonds worrying about bonds losing some value is irrational. For a holder of bonds as a repository of savings that might be needed in full at a specific time, it could make sense to be concerned about getting back the exact value. Between those two purposes is where we get all the discussion about holding bonds to maturity, invest in CDs instead, why a bond fund is or isn't a problem, etc. It is just a question of looking at what one is trying to do. When investing into a bond fund (or, everytime one decides to leave his investment into a bond fund), one must always consider the fund's average duration. In the case of Vanguard Total Bond Market Index Fund Investor Shares (VBMFX), the average duration is approximately 6 years. One should be ready to see the fund's returns vary up and down for the duration. But, it's extremely unlikely for a bond fund to show a loss over a holding period equal to its average duration. As can be seen in my previous post, over the last 8 years (2 years longer than duration), returns were positive. The worst ever annual return of VBMFX, on a total-return basis (e.g. with distributions reinvested), was -2.66% in 1994. That event is often called the "bond massacre" or "bond crash". It looks nothing like a "stock crash". Note that this was a single-year return. VBMFX never had a 6-year negative total return. For those who will, invariably, mention "inflation-adjusted returns", let's not forget that inflation-indexed bonds do exist, they're called TIPS. There's iShares TIPS Bond ETF (TIP) which is a total-market index ETF. Its average duration is a little less than 8 years. As a result, it should be more volatile than VBMFX. It would be extremely unlikely for TIP to show an inflation-adjusted loss over a holding period of 8 years or more. Last edited by longinvest on Wed Jun 06, 2018 8:57 am, edited 2 times in total. The quantity of shares is 3,483.
thanks again for the help... I do appreciate it. Meant to also say... all dividends and gains are reinvested... I've not withdrawn any funds from the account. Last edited by HonBee on Wed Jun 06, 2018 8:55 am, edited 2 times in total. One should expect the fund's returns to vary up and down for the duration. It's extremely unlikely for a bond fund to show a loss over a holding period equal to its average duration. As can be seen in my previous post, over the last 8 years (2 years longer than duration), returns were positive. The worst ever annual return of VBMFX, on a total-return basis (e.g. with distributions reinvested), was -2.66%. But that was a single year return. VBMFX never had a 6-year negative total return. I would argue that however useful duration is for understanding the mechanics of bond pricing and returns, that it is in fact a red herring from the point of view of portfolio construction and that this red herring produces a lot of fruitless discussion on this forum. For a holder of bonds in a portfolio a more useful point of view is the same one applied to other investments, which is risk and return. The role of duration in that, of course, is that duration can be used as the connection between interest rate variability and price variability as a way to estimate volatility. That is the reason for looking at duration rather than looking at duration to assess some kind of pointless "safety" in some hypothetical scenario of changing interest rates. As always, the caveat is that if one is holding bonds for a special purpose other than as a portfolio component, the issue could be different. But those investors know who they are. Cost per share is what you paid for them. The value today is less than the value you paid, which is why you have a capital loss. In the meantime you received interest so that your net on the investment is the interest gained less the capital lost. That could still be negative but at most times is not. Looking at short term results and worrying about fluctuations in value of investments that by nature fluctuate in value is wasted time and energy, though I suppose it doesn't hurt to use the observation to gain understanding of what investments do. If you have a pressing need to not have any losses, such as that this week you want all the money back without loss, then a bond fund was not a good idea. But you should think why your money is in that fund. Most likely it is not because you want all the money back today. Over time you will get an average return including interest that almost all the time compounds to a gain, but that in the rare event or at specific points in time can lose money. This is simply the market value of the shares you originally purchased. If you purchased 3,483 shares originally and reinvested all of those dividends, then you must own more than 3,483 shares today. This is where your gain comes from, even though the value of your original investment has fallen. What date did you make the original investment on? The brokerage is only averaging the unit price. Here's an example. I buy 1,000 units at $10. One month later I receive $22.50 in distributions. I reinvest this $22.50 into new units, but the price has moved to $10.02. With the distribution, I buy 2.2455 units. I now have a total of 1,002.2455 units which have cost me a total of $10,022.50. The average price per unit is ($10,022.50 / 1,002.2455) = $10.00004481. As the current price is 10.02, the brokerage would tell me that I have a price gain of 0.199551% (possibly expressed as a dollar amount). The fact is that my portfolio has grown from $10,000 to $10,042.50 in 1 month. So, my total return is: (($10,042.50/$10,000.00) - 1) = 0.425%. (I didn't annualize, because the period is shorter than 1 year). OP here.... the contributions to the account were done over time, not one specific date. When the account was first opened ( I think about 8 years ago), I had rolled over funds from an existing account. Monthly I've added to the Bond account (up till about a year ago). If I remember correctly, about a year ago when I rebalanced, I shifted some funds from the stock fund into the Bond fund. Again... all dividends are reinvested. So not sure why the share price is showing 10.95 ....or what that actually means. Last edited by HonBee on Wed Jun 06, 2018 9:15 am, edited 1 time in total. In that case it is likely as longinvest says - that $10.95 is simply the average price of all shares you have purchased. Which creates a misleading view of gains and losses. You could download the account data and find out exactly your basis for all purchased shares and likely see exactly what's happening. My brokerage shows me lots of such meaningless numbers (with percentages, along with them, just to confuse me even more). That's why I've developed a spreadsheet to figure out my personal returns. I've shared it and then improved it with the help of Bogleheads. Last edited by longinvest on Wed Jun 06, 2018 9:23 am, edited 1 time in total. Bond prices can and generally do fall in a rising interest rate environment. That is what you're seeing here. Don't let it worry you. Think of it this way: an individual bond is issued with an agreement to pay a certain fixed rate of interest for a certain amount of time, after which the principal is returned to the bond purchaser. Halfway through the term, prevailing interest rates rise, and new bonds come available paying a higher rate. You would like to sell your bond and put that money into a newer, higher-paying bond. But the demand for your older, lower-paying bond is less, because it doesn't pay as well as the newer bonds. So to find a buyer, you will have to settle for accepting less for your bond than you originally paid for it. Thus, the price of the bond on the open market has dropped. Now consider a bond fund. It holds many bonds of various maturities. As interest rates rise, the bonds in the fund lose market value as described above. But as the bonds in the fund mature, they drop out of the fund and are replaced with newer bonds that pay the higher rate. Those higher interest payments ultimately bring the NAV of the fund back up, counteracting the initial loss in market price of the older bond holdings. No bonds have guaranteed yields unless bought and held to maturity. At a basic level, bonds have fixed interest payments, but that is not the same as a guaranteed yield. The value of bonds (at least high-quality, non-"junk" bonds) is that they are loosely correlated or un-correlated with stocks and so act to lower the volatility of your overall portfolio. But you should not expect that bonds and bond funds will never go down in price. They occasionally will vary, just not as wildly as do stock prices and generally not in the same direction at the same time as stocks and stock funds. but if the Total Bond Fund is operating at a loss (at least my funds are showing a loss).... I'm perplexed. I thought Bonds would/should provided a source of income. Does your fund not pay monthly dividends? Those dividends come directly from the bonds' interest payments. Those interest payments are the income from bonds. As noted above, while bond fund NAVs tend to drop in times of rising interest rates, over time the higher interest payments make up for it. What you're seeing is as described above, a drop in the market price of the fund's holdings, and is a strictly short-term phenomenon. Don't let it spook you. It's certainly not a bad idea to think about a change to your AA as you near retirement. This, after all, is the premise behind Target Date funds in general. But I'm unclear as to just what change you're contemplating. From the tone of your post, it seems that you're considering going to a lower bond allocation than you currently have, maybe even to 100% stocks. If that is the case, I'd recommend you learn more about bonds and get more comfortable with their workings. In my mind, unless your basic living expenses are covered from non-portfolio sources, heading into retirement with an AA of 100% stocks is wildly dangerous. Even 70/30 would scare me (I'm in retirement now and my AA is 50/50). Thanks very much for the help.... LongInvest for those links and OldComputerGuy for that explanation. Thanks very much. OldComputerGuy... I was thinking of rebalancing, but not how you described. I was thinking of taking from the stock fund(s) and adding to the bond fund....so make my AA more like 65/35 or 60/40.... whereas now it is about 70/30.